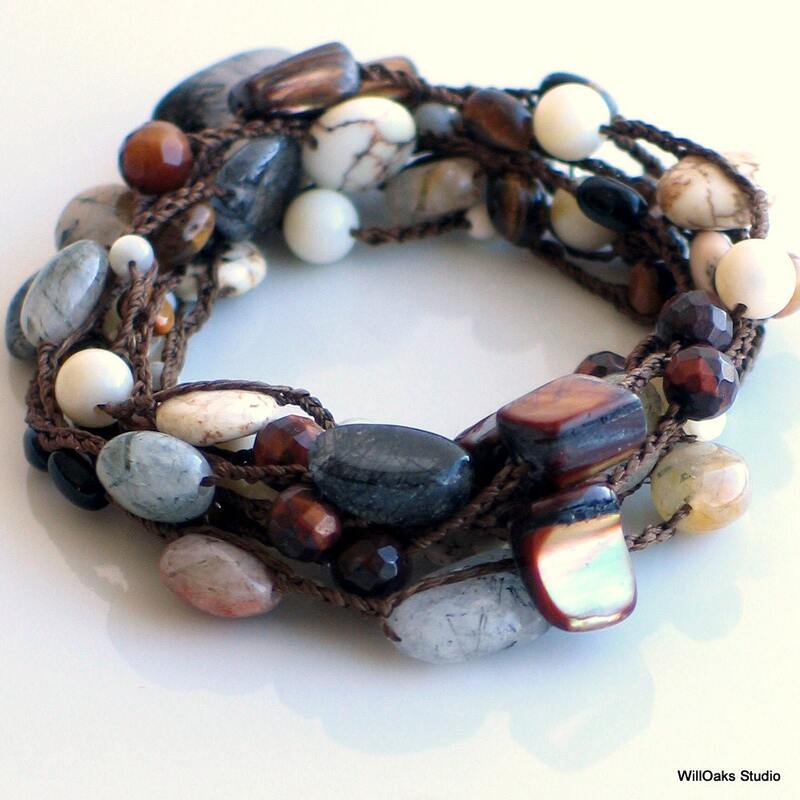 Crocheted silk long chain with a fascinating variety of natural stones to wear as a multilayer necklace or wrap cuff bracelet in neutral earthy colors. Mixture of light, medium and dark colors along a 53" dark brown heavy crocheted silk chain. 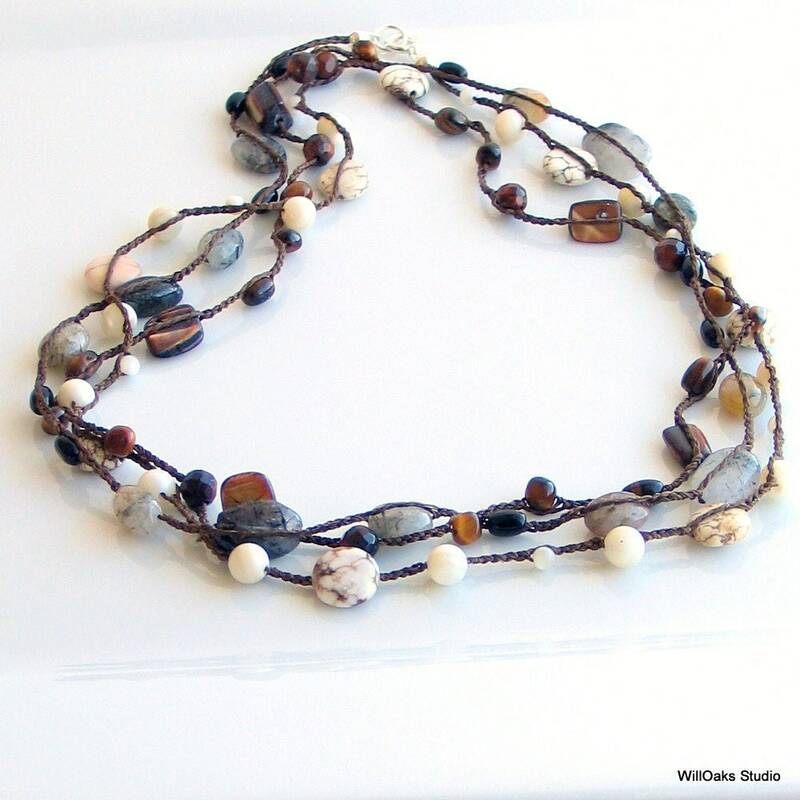 This original design came from some years of collecting parts that could come together as a very rich natural piece using my signature heavy silk crocheted chain. I divided the 53 inch length into approximate thirds. 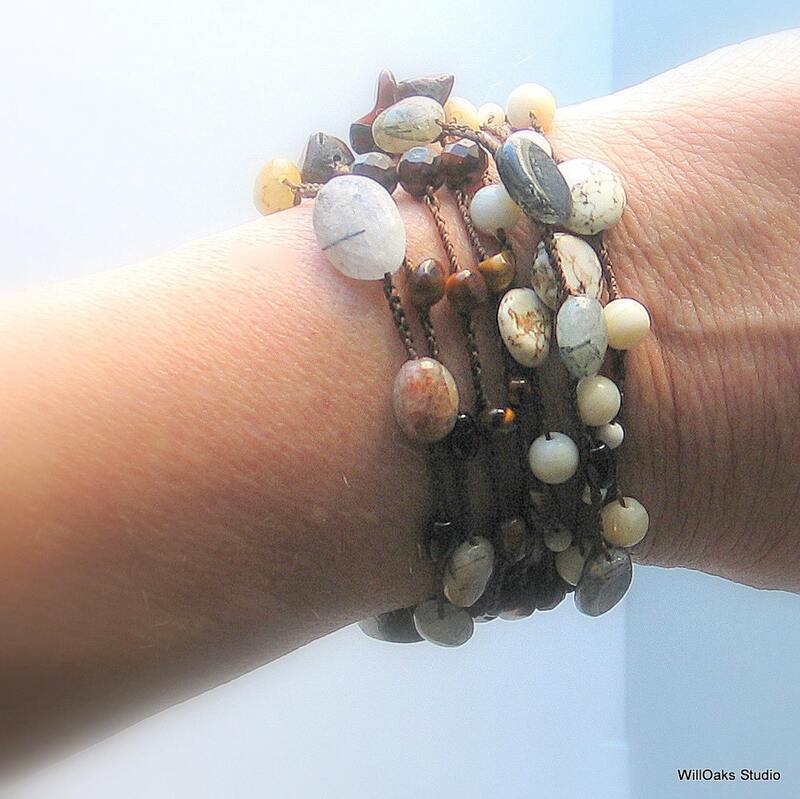 Within each segment, a related pattern dominates: beige and brown, brown and black, black and rutilated quartz in all its muted, earthy variety. Whether this is wound as a cuff, casually draped in two or three clustered or cascading loops, or worn as one long necklace, new subtle juxtapositions are made. Varieties of natural quartz, tigereye stones, shell beads, mother of pearl, and assorted jaspers are included as ovals, rounds, nuggets, faceted and organic shapes. Strong, fine American made silk spaces each treasure along the tight silk chain making a piece that is completely durable and washable. Cool water, gentle soap and a little weight to dry and the chain is clean and good as new. The shapes, numbers and types of beads are consistent from piece to piece but there will be variations in the coloration, matrix and individual character of natural materials. I'm happy to adjust the final length a bit for you, especially if you intend to wear it as a cuff. Please include your wrist measurement in notes to seller and I'll make your piece to fit your wrist AND be the versatile necklace you see here, too. A silver spring clasp and loop close the piece making it easy on and off. WillOaks Studio "Made With Silk" are shipped in velvet pouches, perfect for storage and all ready to give or to keep. Please wander my shop here and thank you for stopping by! Wow -- this necklace is even better than I hoped. 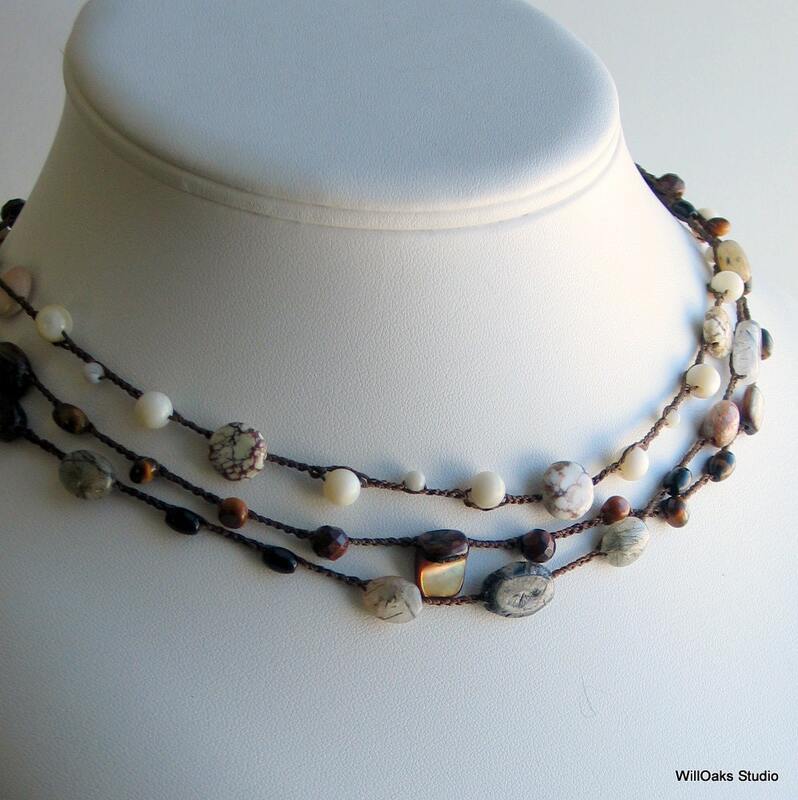 The stones are lovely, and the silk chain is smooth and comfortable. Great fit, too. Love this necklace! Thank you very much!